The first modern circus was staged by Philip Astley in London, England on January 9, 1768. The flagellation of Rose Keller took place on April 3rd, Easter Day. 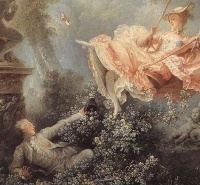 The beginning of the end of Rococo occurred in the early 1760s, when a handful of French students were experimenting with classical styles at the French Academy in Rome, a style taken up in avant-garde salons in Paris from the mid-1760s, as the Gout Grec ("Greek taste"), but which made no appearance at Court until the new king Louis XVI and his fashion-loving Queen came to the throne in 1771. By 1780, Rococo was passé in metropolitan French circles. It remained popular in the provinces ("French provincial") and in Italy, until the second, archaeological phase of neoclassicism, "Empire style," swept the Rococo away. European Neoclassicism in the visual arts began c. 1760 in opposition to the then-dominant Baroque and Rococo styles. The Petit Trianon, a small château located on the grounds of the Palace of Versailles in Versailles, France. Unless indicated otherwise, the text in this article is either based on Wikipedia article "1760s" or another language Wikipedia page thereof used under the terms of the GNU Free Documentation License; or on original research by Jahsonic and friends. See Art and Popular Culture's copyright notice. This page was last modified 09:48, 7 March 2014.